Chinese noodles are an essential ingredient and staple in Chinese cuisine. There is a great variety of noodles, which vary according to their region of production, ingredients, shape or width, and manner of preparation. Left: Noodle making in Taiwan. Chinese noodles are generally made from either wheat flour, rice flour, or mung bean starch, with wheat noodles being more commonly produced and consumed in northern China and rice noodles being more typical of southern China. Egg, lye, cereal may also be added to noodles made from wheat flour in order to give the noodles a different colour or flavor. Arrowroot or tapioca starch are sometimes added to the flour mixture in low quantities to change the texture and tenderness of the noodles' strands. Cut - The dough is rolled out into a flat sheet, folded, and then cut into noodles of a desired width. Extruded - The dough is placed into a mechanical press with holes through which the dough is forced to form strands of noodles. Peeled - A firm dough is mixed and formed into a long loaf. Strips of dough are then quickly sliced or peeled off the loaf directly into boiling water. Pulled - The dough is rolled into a long cylinder, which is then repeatedly stretched and folded to produce thinner and thinner strands. Kneaded - A small ball of dough is lightly rolled on a flat surface until it is several centimetres long and spindle shaped. 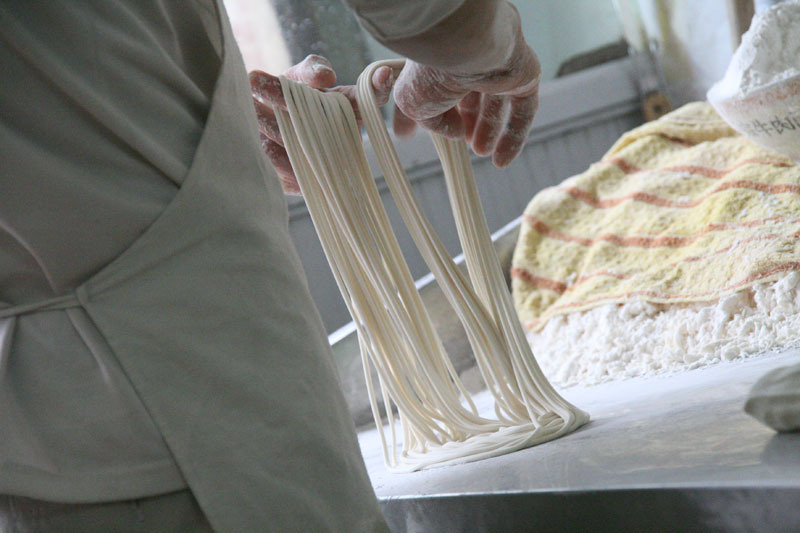 While cut and extruded noodles can be dried to create a shelf-stable product to be eaten months after production, most peeled, pulled and kneaded noodles are consumed shortly after they are produced. Left: Pulling wheat dough into thin strands. Noodles may be cooked from either their fresh (moist) or dry forms. They are generally boiled, although they may also be deep-fried in oil until crispy. Boiled noodles may then be stir fried, served with sauce or other accompaniments, or served in soup, often with meat and other ingredients. 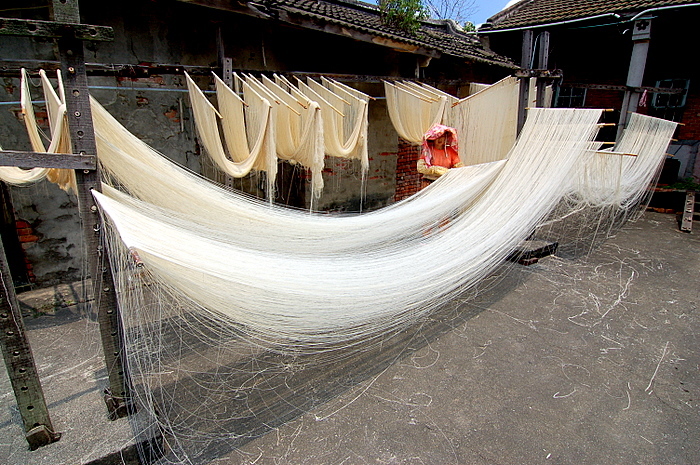 Certain rice-noodles are made directly from steaming the raw rice slurry and are only consumed fresh. Unlike many Western noodles and pastas, Chinese noodles made from wheat flour are usually made from salted dough and therefore do not require the addition of salt to the liquid in which they are boiled. Chinese noodles also cook very quickly, generally requiring less than 5 minutes to become al dente and some taking less than a minute to finish cooking, with thinner noodles requiring less time to cook. Chinese noodles made from rice or mung bean starch do not generally contain salt.